Did Ireland have any Roundhouses back in the days of Steam? I believe there may have been one at Broadstone? I don't think I've ever seen one in model form on an Irish themed layout. You are right about Broadstone. Part of it, roofless, remained into the 1950s, at least. Loads of photos of steam locos in front of the remains at that time. To it you can add Clones and Portadown which were copies of each other and built in the late 1920s in Ferro-concrete. The one at Clones is still there in industrial use. As for models - well, the Portadown one has been modelled by William Redpath and was on show at Cultra last November - see the thread under "What's On on this site. He's done a super job. I'm as jealous as can be, for the same set-up, without the actual roundhouse is in my left, for my railway is based around "Portadown Jct". Time to concentrate on the layout before it's too late? There was also another in Dublin but not on the main line railways! Connolly had/has one. Base of it remains if you go down sheriff Street. R.
Didn't think that Connolly ever had a roundhouse. Which bit of Sheriff St are you talking about Richie? Back in 2015 the good lady wife bought me a book called a Portrait of Dublin in Maps and I spotted an early plan of Connolly. Curiosity got the better of me, so I rambled down the following day and took these. Book is in the attic, somewhere, I'll try and dig it out over the weekend. It was when Connolly was just a terminus and the loop line had yet to be built. Fascinating bit of history! If you can dig out the book, I'd love to hear more. Richie, You certainly left me scratching my head when I read this post, so I'd be interested to hear the "evidence". Oddly enough, the GNR history (both Patterson and Murray) make little comment on the Company's loco sheds. A scan of the IRRS Journal index proved fruitless as well. Ah, I thought, take a look at Norman Johnson's GN loco book - nope! It did yield a photo of the shed we now know as Amiens Street Shed which was taken at least a hundred years ago and it clearly is today's structure. So, cough up the info, young man! It is strange that while British sheds have been the subject of several dozen books on sheds - I think at least fifty - no-one seems to have written any kind of treatise on them for Ireland. Well done, Ernie - it's appalling that I forgot the Guinness roundhouse, having scanned slides of it recently! Fair enough Leslie, I'll trawl the attic in the morning, but nobody was more shocked/tickled/bemused than I to see it. The track layout had all the hallmarks of a traditional British terminus layout you'd expect in a sleepy hamlet, sort of fare you'd see at shows and exhibitions. At the risk of excitement, it was a particularly British format, without forethought to the loop line, yet to come. As for sheds, I'm sure, had I the time, I could regale in print the vagaries of "English garden wall bond" brick as an aesthetic and structural choice for GNR sheds, but twould bore the arse off everyone. The Historic 6 inch map of 1829 to 1842 shows the location of the Dublin to Drogheda line which seems pretty close to the line of the present day raised line. The 6 inch Cassini map of 1830 to 1913 shows the later development of the present day raised line. And the Historic 25 inch map of 1888 shows again further development of the raised line. In the location of the photos posted above a curved line is indicated just after the bridge on the two later survey maps, they also indicate a long shed with two tracks entering from the northern end, as these tracks are on grade with the main line and the roadway is well below the tracks I believe this curved line is indicating a retaining wall, and that is the wall in the photos. I also believe a roundhouse would require a substantial frontage area and most likely a turntable- where in this location there is just not the space to do so with its proximity to the main line. Also note that the ashlar wall returns around at the northern end facing back into the main line track, which would cut off access for locos to get to the shed! 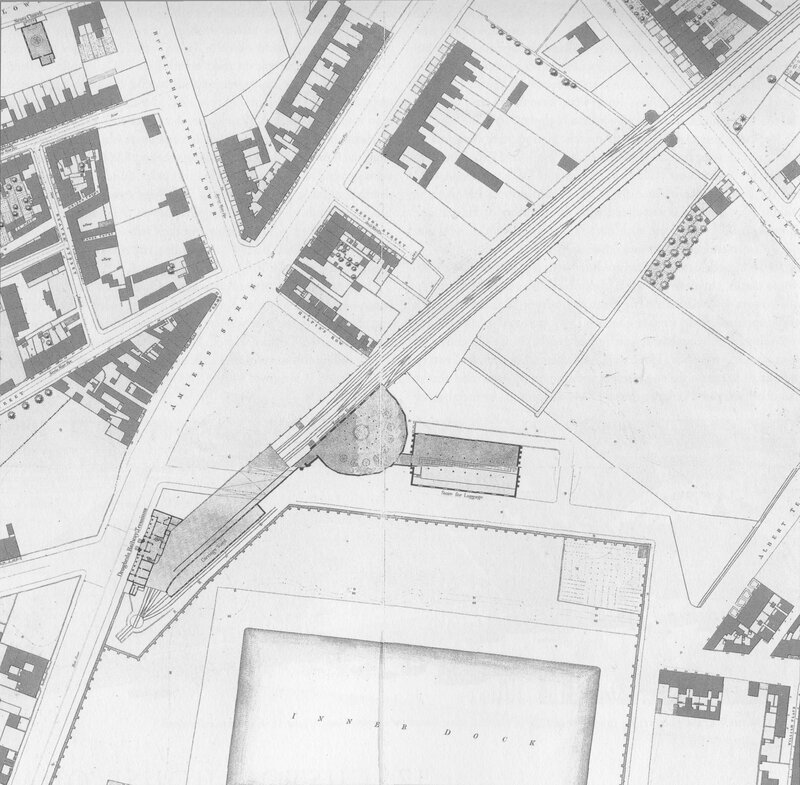 On doing a bit more map searching I found a pdf file on the 'Wide Streets of Dublin' containing a map of Dublin of 1876 showing Amiens Street Station terminus with a semicircular structure adjacent the railway line, this would have been when the track was not elevated! I found a second map dated 1883 which again shows the semicircular structure and a connection to a rectangular structure off to the east- which would be off the edge of the above map. It looks like it was a building after all and not a retaining wall and when the track was elevated it was built on? 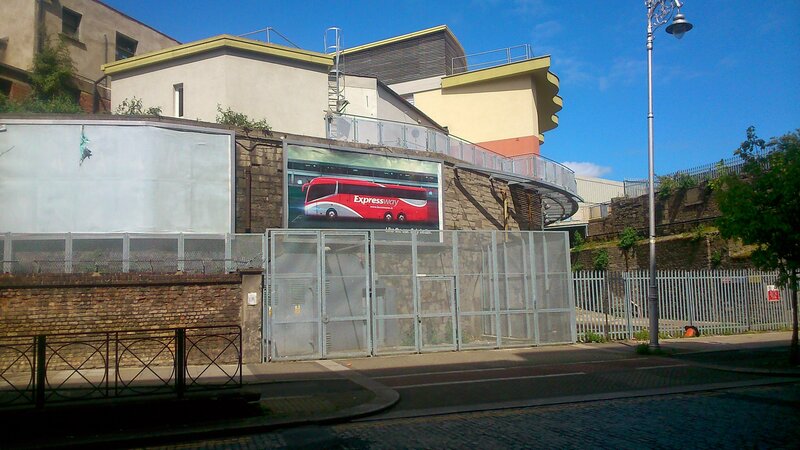 Would you friendly railway historian have an information about the arches that are at Rostrevor Terrace? There are 7 arches and in the embankment under the water tower there are 4 more. Would they also have been used to take goods and materials from railway level to street level? Also at that location there was a small turntable (I believe for turning wagons) and I think an inspection pit. See OSI map of 1891. There is also a stairs of 2 flights on the outside of the embankment wall and the cantilever supports for the top platform as still visible on Google Street View as is the outline of a redbrick doorframe. Any information on what was going on here welcome. These arches look as reduce the construction of the embankment due to the height and there was a stair access from street level to the water tower if correct. Hope this helps. ps the arches do not continue through to the other side of the embankment. 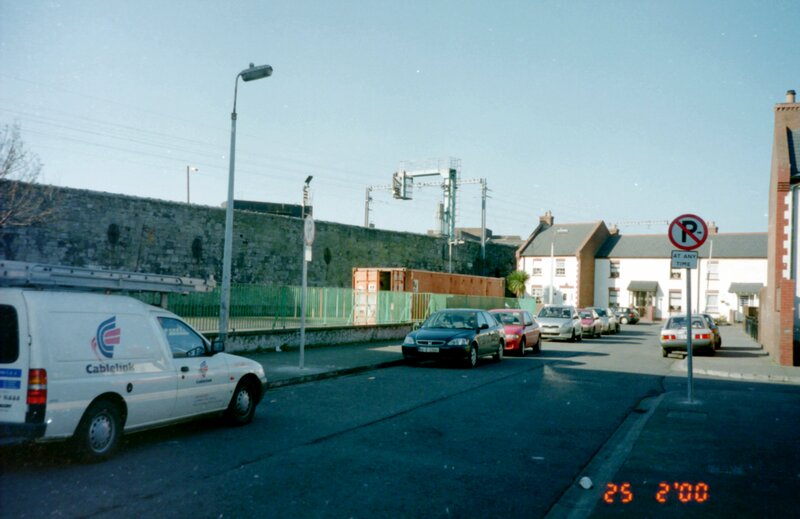 The Dublin & Kingstown Railway was constructed on a raised fill so not to interfere with the established streets of Dublin, the arches were constructed so public access under the rail line was provided as their was quite a bit of objection to constructing the line and cutting people off in their established communities. Thanks Warb. Nice photos, especially of the water tank. Thanks, Eoin, for doing that research - the old maps can be a mine of information. Ernie, thanks for the shot of 137. Not for the loco, but it's the first view I think I have seen of the format of the rear wall of the Broadstone roundhouse. Now, who's going to build a model of Broadstone in MGWR days? - The buildings are still there to work off and now we have a bit more info on the loco shed. I found a far better map dated 1880 similar to the map above, with 3 buildings to the East of the station- all text labelled! 'Engine Ho.' 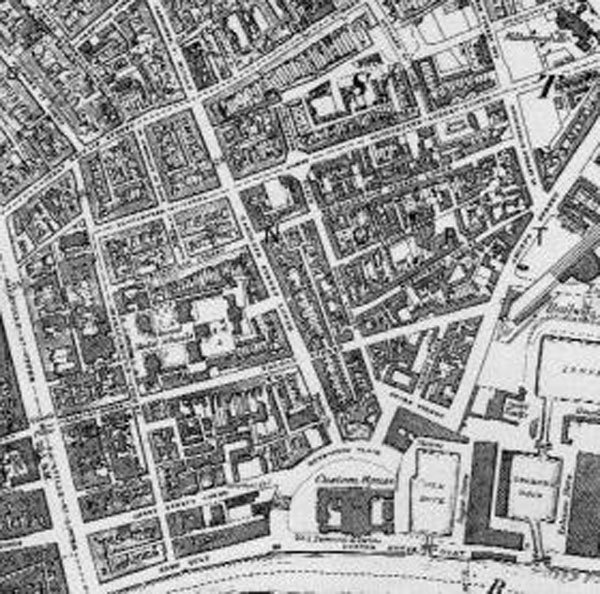 for the building we're discussing, East to that 'Luggage Store' with a narrow connection back to the first building, and then East again 'Work Shop' on the building just before Lower Sheriff Street turns towards the Liffey. First;- a planning application for a dreadful major development of the whole station yard, the surrounding streets, offices and apartments towering over everything, permission was granted but noting in the documents relating to this discussion. 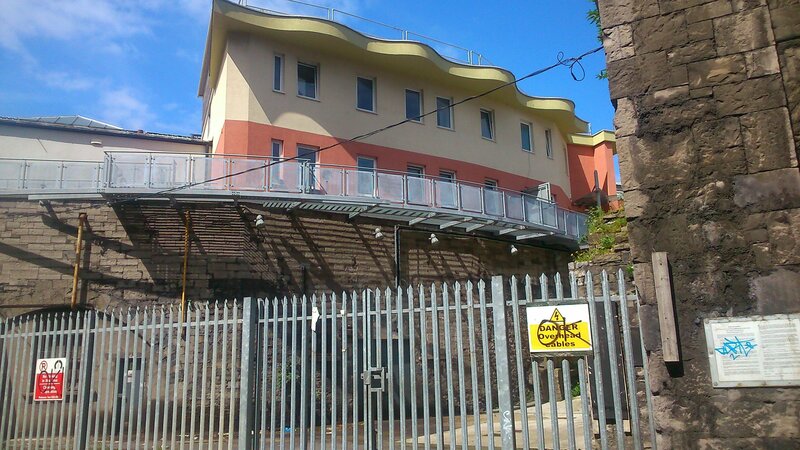 They also mention that 'an extension of the public platform to the East extended over part of this building', so some of the Engine House is under the platform and not seen from Lower Sheriff Street. I would be inclined to go for one of the above theories other than a loco roundhouse, due to space at least. Since roundhouses were so rare in Ireland, I can’t help thinking that’s its highly unlikely that the existence of one would go unnoticed by some of our most eminent railway historians over the years. Yes I think that is most likely what it was for, also the issue of street level arched openings? 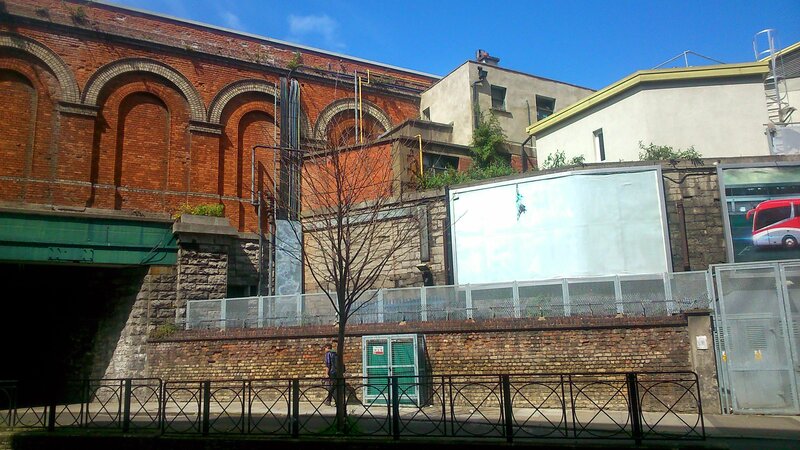 ;- I found a reference to the 'station being built on 27 arches to raise the track 24 foot above Amiens Street and a number of arches were used for storage of luggage, this is now the 'Vaults Bar''. 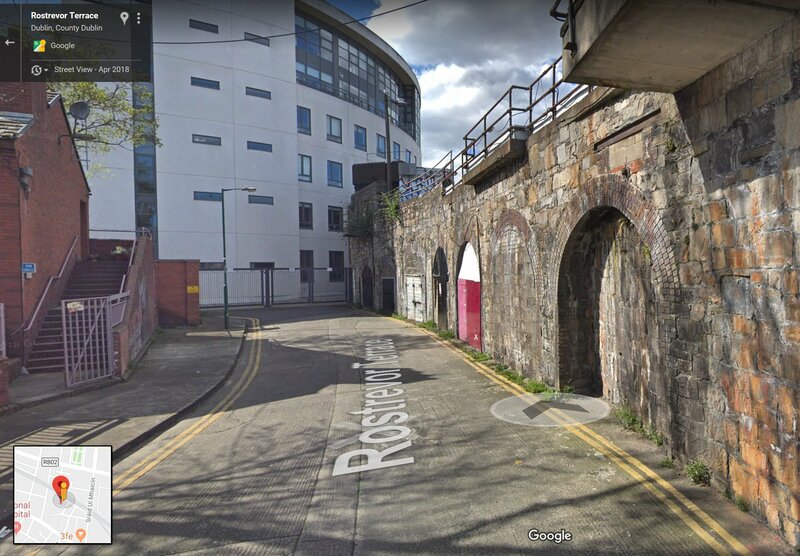 These arches were accessed from the Eastern side adjacent to the Inner Dock and the building of our discussion is in the right location to transmit luggage down from a train and out through the arches to this storage area or through the link to the East Luggage Store building on Lower Sheriff Street.....maybe? There's a couple of issues here - the luggage hall is still present, albeit missing it's first floor to the rear on Sherriff Street, not the vaults themselves - They may have been for bonded goods like rum & tobacco. Anyway, this should clear things up. There are 8 minor ventilators shown on the roof and a much larger one centrally. I saw some of that detail in the planning documents but the scan by DCC was to black& white and the detail was almost imposable to make out because of the tone over the structure! One thing about luggage back in those days, it wasn't just suitcases! Some folk who travelled to their country houses brought their furniture with them- no point in splashing out good money on a second set when it would just sit around for half the year. They would pack up their house and street cart it to the station or special facilities like Brownsbarn out on the Naas Road for delivery to their destination. This is one reason why a lot of houses in Dublin had rear enclosed coach buildings, they could sneak out the furniture at night to the rear so they would not be seen and shamed. Brownsbarn and some of the other companies provided huge carts pulled by oxen (cheaper to hire) and deliver to luggage stores in the one go and then street cart it to final destination. The Brownsbarn building we see today is about 1/3 of what the company had to store luggage in as it was been prepared for the journey. Interesting no obvious sign of a goods yard. Goods traffic seems to have almost been an afterthought on early passenger carrying railways like the Liverpool & Manchester, Dublin & Drogheda, Cork and Bandon and Dublin and Drogheda. Its possible that the Luggage Hall may have handled urgent or valuable goods traffic (wines, spirits, tobacco?) in addition to "Baggage". 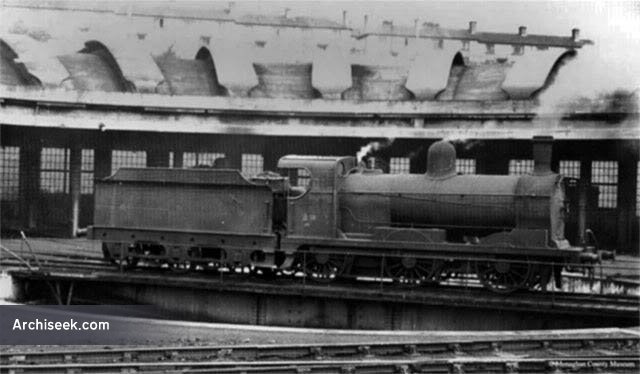 Early coupled engines like the Liverpool & Manchester "Lion" 0-4-2 were described as a Luggage or Baggage Train locomotives, the MGWR had completed its main line to Galway and had 23 (2-2-2) passenger engines on the books before buying 0-4-0 No24 Hawthorn for "Baggage Train" service in 1852. 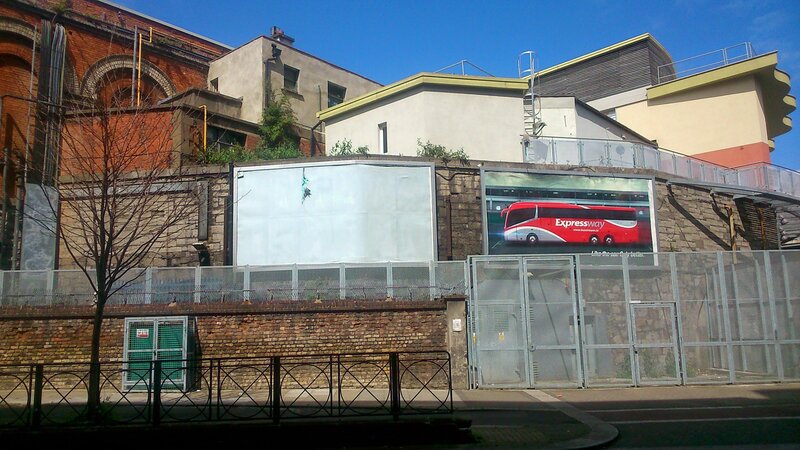 I don't like Connolly Station now it's such a mess, but I see Amiens St terminus in a whole different light! It's going on my list after I complete the Kingstown Station layout.